Spring Training is long, right?!? That realization is again hitting me upside the head as I stare at the calendar each day in the hopes that I can just will the days to move more quickly. I'm failing. Instead of stewing and fuming, why not look at some spring numbers? Uh-oh. I said it. Spring training numbers! We all know the story. They may have little correlation to upcoming season, but that still doesn't stifle our imaginations that great in March foretells great in the summer. How do I know? Look at ADP movement. For this week's column, I'll profile a large group of guys who are excelling in either Florida or Arizona. What's their overall ADP? What's their ADP in the past two weeks? Are they worthy of the move? What should the seasonal expectations be? Many questions mean many answers. Colorado is hosting a position-battle at 2B and both guys are showing their top-end. McMahon is leading all MLB players with a batting mark of .462. He's also bashing the ball over the field with nine of his 18 hits going for extra-bases. The problem is Garrett Hampson (184, 123/302, Recent - 174). The rookie is nearly matching McMahon swing-for-swing. Hampson is a heavy favorite to win the job, while McMahon looks like a back-up utility man who can handle 2B, 1B, and 3B. The Colorado effect plays and the multi-positional eligibility is a bonus. He's definitely worthy of a bench slot even without a starting gig to begin the year. Paddack has a chance ... to be the Opening Day starter for San Diego. The Padres don't have an easy answer for that call and Paddack has been impossible to ignore in camp. Unlike seemingly every other hurler to make their way up the prospect list, Paddack features command over velocity. His change-up is a thing of beauty and he's used it to dial up a spring-leading 20 punchouts in just 12.2 innings. He has yet to throw an official pitch above Double-A, but that will change very early this season. If you can snag him as an SP5/6, do not hesitate. The helium just keeps getting pumped in. Bieber has been living in the master bedroom of fantasy touts for a few months now. He throws strikes on pitch one, he gets ground balls, and he can whiff 5 guys for every one that he walks. It's a tidy profile. Bieber is locked-and-loaded as an SP3 option and has a good shot of topping 170 innings. 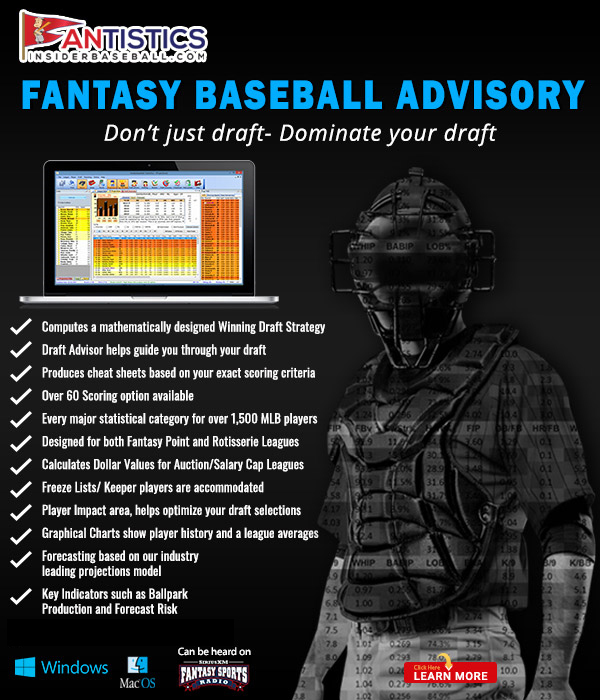 Throw in the Cleveland rotation factor and you have a pitcher who will be selected inside the first 10 rounds of your draft. If your first two SP lean 'established' on the spectrum, Bieber makes perfect sense. Warning ... Mets fans are starting to get excited about the upcoming season! That oftentimes means a summer of dread is headed to Queens, but maybe 2019 will be different. Maybe Alonso will be a part of it. But, when? That's the big question at this point. The Mets are leaning towards starting Alonso at Triple-A. He's been seeing a load of chances in the box (his 40 spring ABs are top-5 in baseball) and has generally performed well (15 hits, including three home runs). The New York contingent will draft him as a corner infielder with the expectation that he is up by May. He makes much more sense as a bench option, though. His power is totally legit, but there's a good chance his average could be close to .215 with a load of whiffs. The Holy Grail of fantasy profiles is 'power/speed combo.' Brinson has it, but hasn't shown it. He was an utter mess last season and should have been firmly situated in the minors. But, this is Miami, so a .199 hitter remains on the 25-man roster all season. Goodness. Brinson is back this season and there's no reason to avoid sending him out there now. At the very least, he's brought the pop in spring camp with five HRs. Still, he has struck out 10 times, he's 1-for-3 on stolen base attempts, and almost all his damage came in the first few spring games. Tempting, but still deserving of a spot on the waiver wire. Kang hasn't been a regular part of the Pirates' roster for two years because of off-the-field issues. On some teams, his opportunity would have flown the coop and he'd be begging for another shot. But, Pittsburgh needs Kang. They currently are forcing Colin Moran (448, 300/598) on all of us and it's not sitting well. And, oh, here comes Kang with 5 spring moon shots. But, that's it. That's ... literally ... it. Kang has only the five homers and no other hits. When he doesn't hit a round-tripper, he's 0-for-20 with 13 whiffs. Don't fall for him ... or Moran. Flaherty's 'jump' isn't very similar to many of the others on this list. As is so often the case in the Top 100, it's just too tough to overcome the talent ahead of you. Flaherty appears ready for a jump in production. Whispers from 'unnamed National League sources' indicate Flaherty is near-Cy Young-ready. His fastball/slider-combo is special and he should be able to post a K-per-inning. He's also a good bet for 170+ innings. He struggled a bit at the end of last season, but that isn't affecting his draft standing. I TOTALLY understand the cost and the hype. But, I'm not there at the cost. Walks and homers have cropped up as a minor issue, St. Louis will work many arms into the rotation, and Flaherty is still working to control his on-field emotions. Lopez has drawn raves throughout Marlins camp. Perhaps it's just because of all the surrounding muck on the roster ... It's easy to stand out. The 6'3" right-hander got a taste of the bigs with 10 starts last season and didn't show anything extraordinary (he also missed the end of the season with a shoulder strain that is apparently a non-issue now). This year he appears to have added velo (touching 97 after averaging less than 93 in '18), while improving his breaking ball. Results-wise, he's produced 11 K's against just one walk in 14 innings and appears to have forced his way into the Miami rotation. Having a pitchers' paradise to call home helps, as well. He comes in as a very good speculation add. A lot of fantasy players are totally out on the Blue Jays presumptive ace. It's no surprise following a truly terrible 2018 where he barely crossed the 100 inning threshold because of injuries. Even when he was 'healthy' enough to be on the hump, he failed his way to a 5.54 ERA and 1.47 WHIP. And, of course, Stroman doesn't have whiffs to save him (7.3 K/9 for his career). In massive need of a fresh narrative, he's come to camp with four solid appearances, but many aren't paying attention. He's boring, he's been around for awhile, and he's coming off a brutal season. Heck, a spring no-hitter likely wouldn't bring any more attention! 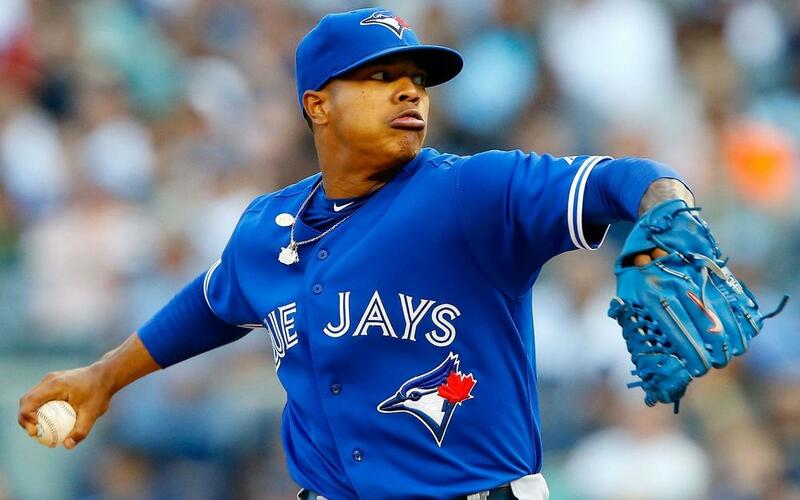 Stroman must stay healthy this year and if that happens you'll have a much luckier (5.54 ERA vs. 3.91 FIP) ground ball pitcher who is a sleeper bet for 200 innings. At such a dirt cheap cost he is a fantastic late-draft selection. Anyone ever heard of the other hot shot Toronto rookie?? They're starting to with an on-going big March effort. Bichette (yes, the son of that Bichette) has rolled to an excellent spring slash of .441/.500/.882. Obviously, he's not that incredible, but what you have is a perfect stash in deeper leagues. I would call for Bichette to be up with the Jays around the All-Star break and you could see a stunning amount of ... steals. And, everyone loves steals! Bichette could rack up 20 in less than 100 games ... and perhaps more. He's not a fit in every league out there, but he's perfect to draft-and-bury in deeper set-up's. What did I say about Brinson and the power/speed combo? People love it. And, despite a few seasons of lacking results, fantasy players are back-in on Buxton for 2019. His quick start to the spring erased so many memories. And, you know what? I'm down for it. Getting him near round-12 is a well-played risk/reward selection in my book. He's worked to revamp his swing and, notably, he has gone down swinging just four times in 26 Florida bats. I still don't think he'll ever see a .280 batting mark, but 20/30 is still utterly do-able. Yes, I, you, them, everybody ... all is forgiven Byron Buxton! He's been fantastic in camp with a measly one earned run allowed in 13 innings, but he's still little more than streaming quality for the regular season. Montas can fire a quality start and roll a few of them together. Overall, though, he's a pitch-to-contact kind of guy with a too much slack in his punch-outs (6.0 K/9 last year) to be entrancing. He has shown fine marks in the minors, but he's a low-ceiling, decent-floor option that can be picked up and dumped throughout the season. OK everywhere, but nothing above-average anywhere.